At present the reindeer-breeding is in a deep crisis in many regions of Russia including in the Sakha Republic (Yakutia). At present the reindeer-breeding almost cannot be transmitted into market conditions in our Republic because of a number of objective causes. But the reindeer-breeding has been existed in our country from ancient times. According to historical data, the man met a reindeer in the deep past. The most ancient story about reindeer-breeding is in the Karelian epos: Kalevale. The first information about the reindeer-breeding in Scandinavia is in the Scandinavian saga, in particular, in the saga about Otare, a head of northern Norman tribe, who had more than six hundred reindeers.1 The origin of reindeer-breeding was determined thanks to the archaeological data, in particular, thanks to the excavations in a burial ground in the Askyzskiy region of Khakasia made by L.P. Kyzlasov. The reindeer-breeding was determined as originated from the 1st or 2nd centuries AD (Tashtyk era).2 This is also confirmed by the data of Academician A.P. Okladnikov.3 Perhaps the reindeer-breeding in Europe and the reindeer-breeding in Asia originated independently on each other. The opinion of specialists that the origin of reindeer-breeding is in Europe (in Scandinavia) as well as it is in Asia (in a territory of the Altai ans Sayani plateau) is firm. It is quite possible that the origin of reindeer-breeding is also in the North near the Arctic Ocean because there was a lot of reindeers in the past. Almost all the ancient epich stories of indigenous Northern peoples have the data that such a version is possible. The destinies of the indigenous small peoples of the North, their nomadic way of life and their unique civilization of reindeer-breeders, as an original part of the earth civilization, are connected with reindeer-breeding. The reindeer-breeding surely overcame several stages in its development. In Russia, the first literary information about reindeer-breeding of Northern peoples appeared after that the northern and eastern territories were joined to the Russian Empire i.e. from the 17th century AD. The Northern peoples were divided into «sidyachie» (sedentary) and «olennie» (those having reindeer) i.e. «osedlie» (settled) and «kochevie» (nomadic). During the first years of Soviet power, the community soviets were established as nomadic communities currently. But these community soviets had broader rights than those of our nomadic communities. During the Soviet power, many transformations had place in a life of reindeer-breeders. But these transformations didn’t consider the main thing: the way of life. Thus, in its Decree «On rendering additional help in the development of economy and culture of the peoples of the North» of February 20, 1960, the RSFSR Soviet of Ministers called to transmit all the nomadic population in the Far North into a settled way of life in the nearest years.6 This was a damage to a centuries-old way of life of reindeer-breeders and this had negative social consequences for a people. The reindeer-breeding is surely a basis for nomadic way of life. This way of life may be eliminated only together with the disappearance of reindeer-breeding. If a reindeer disappears then the northern people will disappear: reindeer-breeding is a traditional activity of northern people. 1) to restore the nomadic and semi-nomadic family and community way of life of reindeer-breeders within their traditional ethnic territory on the basis of family and community private and other forms of property on reindeer. Therefore it is necessary to determine a special status of nomadic way of life of reindeer-breeding peoples and ethnic groups in the Federal Law «On northern reindeer-breeding». b) in social care and settlement of nomadic families. Thanks to practical support of the President, Parliament and Government during the last decade in the Sakha Republic (Yakutia), the hard burden of transition from one socio-economic formation to another became softer but we couldn’t avoid the big losses in a number of reindeers and the deterioration of socio-economic state of families of reindeer-breeders. Several measures are undertaken by the State and the indigenous peoples themselves but a «key» to settle problems is not found yet. Perhaps, therefore the problems of reindeer-breeding are included into the Programme «Village» but village is a settled way of life. It is urgently necessary to work out an independent State programme «Restoration of nomadic family and community way of life of the reindeer-breeding peoples of the North» for we deal with the survival and further destiny of the indigenous small peoples of the North. At present the situation is as follows: in Figure 1. If there were 367000 reindeers in the Sakha Republic in 1990, then there are 138513 reindeers now. The indigenous small peoples of the North looked for ways of salvation and they founded communities. In order to restore a nomadic way of life, it is compulsory to reunite a family of reindeer-breeder i.e. to create them social conditions for leading a nomadic life. Therefore the nomadic communities of the Sakha Republic (Yakutia) urgently request that their children be together with them. In the post-Soviet period, having looked for ways of survival, the indigenous small peoples of the North decided to return to their own sources: to revive the traditional way of life of reindeer-breeder, hunter and fisherman. This is a nomadic, semi-nomadic way of life. Nomadic life is a unique civilization created by peoples during many centuries. Its main achievements are: preservation of a site for human living in the pole of cold, preservation of traditions, customs, continued connection between generations; creation, preservation and development of ethnic culture as a part of the circumpolar culture of the peoples living along the Arctic Ocean coast. The system of education of reindeer-breeders, hunters and fishermen cannot be outside of a nomadic way of life. This reality sets up quite inordinary tasks before the united State system of general school of Russia including the Sakha Republic (Yakutia). Thus the current system of education should meet educational needs of the nomadic Northern peoples dispersed in zones (Fig. 1). In fact, this is a new page in educational practice and pedagogical theory. Here one should solve a variety of problems which cover all the elements of subject structure of pedagogical knowledge: general pedagogics (philosophy of education), didactics, theory of education, school studies i.e. organization of educational systems of nomadic peoples. From practical point of view, the role of integrative function of schools in a life of ethnos sharply increases. At present, the following schools expressed their wish and performed a preparotary work towards introducing the various variants of system of community nomadic education: in Fig. 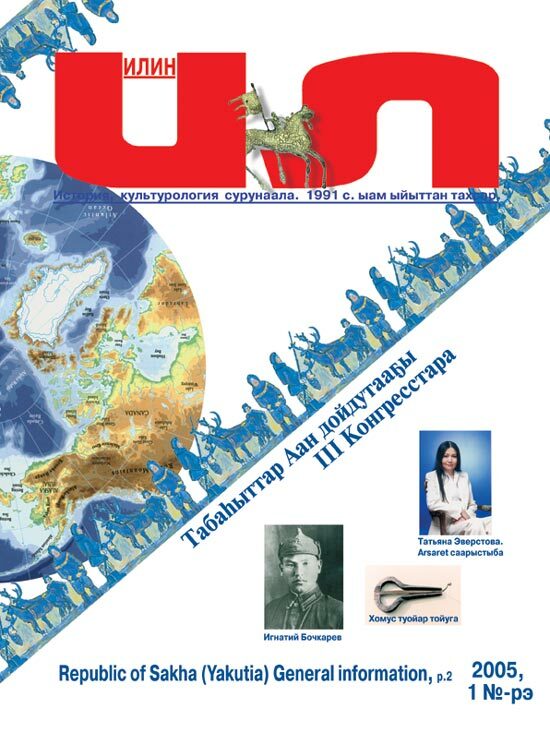 2.
on behalf of our high forum and the intelligentsia of reindeer-breeding peoples, in the connection with declaration of «The week of education for all peoples» (19-24 April, 2004) by UNESCO, appeal to UNESCO with request to declare the year 2004 as an Year of beginning of work in creating nomadic schools of the reindeer-breeding peoples of the world.